Our Time Delay Relays are equipped with firmware built into the board that will allow you to setup delays and complex actions. You can set the relay to trigger before or after the time delay. 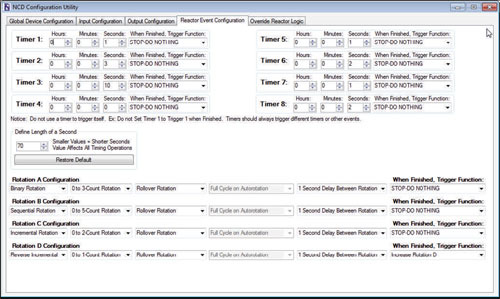 Complex events and rotations can be configured and you can define up to 8 timers that run in the background. Timers support Event Piping. Event Piping means a timer can trigger another timer or another event after the timer has completed its cycle. Configuration software is available as a free download! Set Time Delay before of after you trigger the relay. Trigger relays wigh the included software or with an attached sensor. Time Delay controllers are configured using the custom Configuration Software. Once configured, the controller works without a computer connected, allowing analog inputs to trigger relays according to the configuration. For computer control the relays can be triggered using the software making this a powerful controller without any programming! Up to 8 timers and 4 rotations can be configured to control up to 8 relays based on 8 separate analog inputs. Programmable Trigger Points can Trigger Timers and Rotation Counters when Analog inputs reach preconfigured levels. Find the board you need by using the interactive menu to he right. Hover over the Button and select the number of relays you want installed and then select the computer interface you need. Once there simply select the board with the correct amperage for the item you are switching. Timer events work just as the name implies. You can define up to 8 timers that run in the background. Each timer can have a different time assigned to it. Timers can be triggered or canceled based on input events. Relays can be associated with timers so the relays only come on when the timer is active. Timers support Event Piping. Event Piping means a timer can trigger another timer or another event after the timer has completed its cycle. Rotations are another powerful feature of the controller. Rotations are simply counters. All Rotations begin there counting at 0. Any relays that are associated with a Rotation will turn off if the Rotation counter reaches 0. There are 4 Rotations: Rotation A, B, C, and D. Rotations can also run in the background, or they can be stepped, one count at a time. You can define how far they count. In the above example, Rotation A is a 3-count Rollover Rotation. This means it will count: 0, 1, 2, 3, 0, 1, 2, 3, etc. Rotation B is similar to Rotation A, except it counts from 0 to 5. Rotation C is a 2-Count Rotation, meaning it counts: 0, 1, 2. Unlike the other rotations, Rotation C is a Halt on Limits rotation. This simply means it will count up to 2 and no higher and will not cycle to 0. These kinds of counters usually need a trigger to increase them and a separate trigger to decrease them. You can define two inputs: One to count up, another to count down. Rotations can be interpreted by the relays in four ways. Binary Rotations: Relays activate in a binary pattern. Sequential Rotation: Relays activate in a sequence, one after another until all associated relays are on. Incremental Rotation: Only ONE relay is on at a time, each count triggers the next relay. Reverse Incremental: Same as above, but relay activates in the reverse sequence. Perhaps the most powerful feature of the Reactor Relay Controller is Event Piping. Event piping is the process of one event triggering another event. When a single event has finished its operation, it can trigger another event. For instance, a Timer Event can be set for 10 minutes. A Rotation event can be set for 0-1 count rotation. When the timer expires, the Rotation can be increased. In a real-world example, this would be the equivalent of waiting 10 minutes to turn on a relay. Understanding Event Piping is the key to unlocking the most powerful feature the Reactor Series Relay Controllers have to offer. Analog Inputs are capable of reading switches and sensors operating in the 0 to 5VDC range. These input serve as the heart of the Controller and are the basis for triggering most functions without a computer. The Analog Inputs on a Reactor Controller may be configured to activate or deactivate relays based on these voltage changes. These voltage changes can of course also trigger timers and counting events. (please note: 8 inputs may not be available when ordering the Key Fob Option) Much more information on the operation on these boards can be found in the product manual. Look for the Download Manual button on the product pages.